If you're responsible for managing vSphere in a Windows environment, automating management, monitoring, and life-cycle operations for vSphere increases efficiency and saves you time. 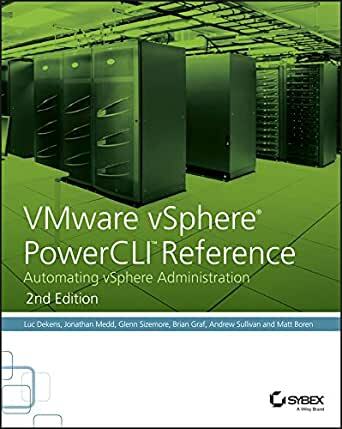 This fully updated reference covers the latest vSphere and PowerCLI releases, providing real-world examples that help you get the most from PowerCLI's handy cmdlets. You'll learn to use the power of virtualization automation to quickly store, access, update, back up, and secure massive amounts of data, with DevOps methodology and structured testing helping you schedule and view automation. With clear instructions and detailed explanations, this is the resource you want by your side. Luc Dekens is a VMware vExpert and PowerShell MVP who has worked with operating systems for more than 20 years. Luc focuses on virtualization, particularly platforms produced by VMware, and blogs about PowerCLI and the vSphere SDK at www.lucd.info. Jonathan Medd VMware vExpert and PowerShell MVP has been automating virtualization products for a number of years. He shares his automation knowledge at www.jonathanmedd.net. Glenn Sizemore VMware vExpert, started scripting early in his IT career, adopting PowerShell early on and conquering it when VMware PowerCLI first shipped. He shares scripts and automation techniques on his blog at www.Get-Admin.com. Brian Graf has worked in IT for more than 15 years and recently has focused mainly on virtualization and automation. Brian is a vExpert and is currently VCAP5-DCA and DCD certified. Brian graduated with a Masters of Information Systems from the University of Utah. You can follow Brian on twitter at https://twitter.com/vBrianGraf or on his blog at http://www.vtagion.com. Andrew Sullivan has worked in the information technology industry for nearly 15 years, with a rich history of database development and administration, DevOps experience, virtualization and storage architecture, and automation evangelism. He is the co-host of the NetApp Tech ONTAP podcast and is a regular presenter at VMUG's, Docker Meetups, and other community events. Matt Boren, vExpert, co-started the http://vNugglets.com blog, focused mainly on virtualization PowerShell automation. Follow Matt on Twitter at @mtboren. 5.0 out of 5 starsYou can multiply your scripting power by two to four just by reading 3 chapters! If you have hit the wall using cmdlets in your scripts this is the book to transport you to the next level! I had a sticking point in a script I had written for a mass configuration change and five minutes after I got the Kindle version I had what I needed. Not only did I find out what to do to fix my script I learned the actual REASONS it wasn't working as written. This book is a must have for someone who finds themselves suddenly going from quick and dirty "admin" scripts to being requested to script a solution that will save the organization lots of time and ensure consistency. Part VI Chapter 25 Running Scripts: Has lots of information that other books assumed the reader knew. Like logging and proper commenting formats. It includes the MUST READ Script Tips and Hints. Part V Chapter 18 the SDK - Take your time and use a lab session to walk thru this and the light bulb just comes on! This is boot camp for the vSphere web client API and whatever your level was when you start this chapter you will be at minimum twice the scripter when you complete it IF you take the time to fully walk thru it. I can't impress that enough. Part V Chapter 23 - Power Actions shows you how to incorporate your scripts into the actual web client! Part 5 Chapter 24 - Source control. You are in a new league after reading chapter 18 so you should really get organized. The other topics are great advise on other projects my organization has coming up and after my recent success I want to be ready when called upon. 5.0 out of 5 starsExcellent reference for automating your vSphere infrastructure. Excellent reference for automating your vSphere infrastructure. 5.0 out of 5 starsIt's written by Luc Dekens so you know it's good. I have the first edition of this book and figured I may as well pick up the second edition. It's written by Luc Dekens so you know it's good. This is the missing documentation for PowerCLI. The book has several good examples and is well written. I would recommend this book to anyone looking for a good book on PowerCLI. 5.0 out of 5 starsIf you only buy one PowerCLI book, make it this one. The second edition of *the* definitive PowerCLI reference book. Just when you thought they couldn't add any more content, the second edition adds another couple of chapters and hundreds of pages of content. Written by the masters of Powershell and PowerCLI, you have no doubt come across each of their names whilst googling the answer to some obscure question with PowerCLI, or vSphere in general. The book itself covers a wide range of topics for all stages of PowerCLI knowledge. That said, the book assumes a base level of Powershell knowledge. This should be a fair assumption- afterall Powershell has been out the best part of a decade- but I personally quite often run into administrators that have limited or no knowledge of Powershell. Chapter 25 and the Appendix cover the basics of how to execute scripts and some Powershell function for these inexperienced users, however this may be missed if progressing through the book from the beginning. Other than that; if you only buy one PowerCLI book, make it this one. Power CLI 2nd Edition - A “must have” book for anyone who is working with VMware products and wants to add value and save time. The book has been helpful to me for three reasons: it has taught me how to automate those mundane tasks that everybody hates to, it has enabled me to remove the human error - making sure results are consistent, and most importantly it has given me back some much needed time to tackle more interesting problems/tasks (after all once you have written a script once it can be re-used on many projects!). Firstly, I will admit I haven’t read every single line on every single page. However, in my opinion, this isn’t the kind of book you will necessarily read from cover to cover in one sitting. It is, after all, a reference book, therefore whilst some people may read it cover to cover, some people (like myself) will read the sections/pages that are relevant at the specific project or task at that point in time. One thing is clear, it is a book you will keep returning to when you are sitting there scratching your head and mutter to yourself “there has to be a better/faster and more consistent way to do this”. The authors have a created a good balance of both empowering and informing the reader. Where it needs to, it is specific about the steps required to accomplish a particular task and the end goal, but the book is more than that. The book is about providing the reader with the concise information and background they need to be able to create their own scripting toolkit which will help them make their day to day work easier. The Code Listings provided throughout the book (which are downloadable from the publishers website) provide an invaluable source to add to your own scripting toolkit and I would advise anyone reading to ensure they download and use them. In my opinion, the mark of a good technical reference book is when it is the first book you think of when you have to solve a problem/complete a task and over the last few months this has been one of those books. In my continual journey through PowerShell and VMware PowerCLI, this is definitely a book I will be referring back to again and again. What are you waiting for? If you are planning to buy a PowerCLI book, you won’t find better.